Roaming from America to Europe to Australia, Lights Out is a trenchant examination of the tensions between a resurgent Islam and a fainthearted west - and of the implications for liberty in the years ahead. In 2007, the Canadian Islamic Congress brought three suits against Maclean's, Canada's biggest-selling newsweekly, for running an excerpt from Steyn's bestselling book America Alone, plus other flagrantly Islamophobic columns by the author. 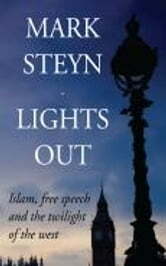 A year later the CIC had lost all its cases and Steyn had become a poster boy for a worldwide phenomenon - the collision between Islam, on the one hand, and, on the other, western notions of free speech, liberty and pluralism. In this book, Steyn republishes all the essays the western world's new thought police attempted to criminalize, along with new material responding to his accusers. Covering other crises from the Danish cartoons to the Salman Rushdie fatwa, he also takes a stand against the erosion of free speech, and the advance of a creeping totalitarian "multiculturalism"; and he considers the broader relationship between Islam and the west in a time of unprecedented demographic transformation. The Global Refugee Crisis: How Should We Respond? In the wake of the recent attack on the offices of Charlie Hebdo Magazine, this book is a renewed wake up call.